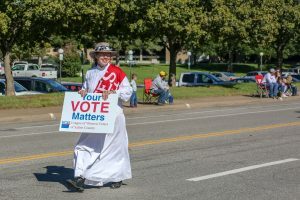 To register to vote in Kansas, a person needs to be a resident of the state of Kansas, a United States citizen and at least 18 years of age by the next state/federal general election. If convicted of a felony, a person must have completed all the terms of his or her sentence before regaining voting eligibility. Voter registration needs to be done 21 days before an election in order to vote in that election. Voter registration must be updated when one moves or changes his or her name. You must show a government-issued photo identification when voting or when requesting a advance-mail ballot. People over 65 years of age may use an expired photo ID. If your name appears on this list, but you need to update your address or name, fill out the voter application form. If your name does not appear on the voter registration list, fill out the voter application form. Primary Election, Tuesday, August 7, 7 a.m. – 7 p.m.
General Election, Tuesday, November 6, 7 a.m. – 7 p.m. Obtain general election ballots by mail after August 15 but before November 4, 2016. Email the completed form to your county election office. Find information on candidates running in your district and issues being voted upon. If you will be 18 or older by November 1, 2016, you can register now. See the Kansas voter eligibility rules.